In 1911, Abraham Tanenbaum sailed from Poland to Toronto, where he built a family construction empire from scrap metal. One hundred years later, grandson Larry Tanenbaum sips vintage wines poured by Canada’s only female master sommelier at e11even, the high-end restaurant in the billion-dollar, bricks-and-mortar holdings of Maple Leaf Sports & Entertainment owned, in part, by Tanenbaum. Though their day jobs were nothing alike — Abraham drove a horse and cart searching for steel remnants, while Larry jets to meetings in his private plane — the two Tanenbaums bookend a century during which the entrepreneurial family helped shape Toronto spiritually, physically and philanthropically. Tanenbaum faith founded the historic Knesseth Israel Synagogue in The Junction. Tanenbaum steel holds GTA buildings erect. Tanenbaum dollars, millions of them, support Jewish and community-wide causes. “Larry’s footprint is everywhere in this city,” says Paul Godfrey, who nearly 40 years ago partnered with Tanenbaum in a losing effort to build an NFL stadium on the then “barren land” at highways 400 and 7. Tanenbaum would not participate in this story, the aim of which was to better understand the reserved man who upped his ownership stake in Canada’s iconic hoops-and-hockey brand to 25 per cent this month. We know lots about others in the organization — Maple Leaf and Raptor players, their coaches, their general managers — but very little about Tanenbaum, holder of the nation’s most-connected pro-sports resume: he’s the MLSE chair, he serves as a governor of the NHL, the NBA and Major League Soccer, and is a member of influential executive committees for each league. The 65-year-old Toronto native is also a construction and investment tycoon, punching in as chairman and chief executive officer of Kilmer Van Nostrand Co. Ltd., headquartered in the Scotia Plaza. Tanenbaum doesn’t have an office at MLSE headquarters. He eats at all the organization’s restaurants and pays his own way. He doesn’t bill the company when he uses his jet for sports business. He gets a pair of tickets for each Leaf or Raptor game — but buys the rest he uses, including the times he brings his 10 grandchildren en masse to the Air Canada Centre. MLSE employees like him. 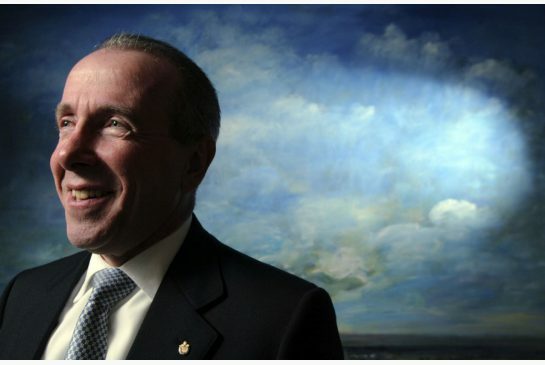 Tanenbaum received a standing ovation last week from staff when it was announced he’d remain chair, even though new owners Rogers Communications and Bell will equally share 75 per cent of the company. What else? Well, the smartly groomed man who’s all business when he’s on the clock likes to loosen his tie now and then. Tanenbaum drinks Belvedere vodka. He’s a foodie, whose wife Judy was known to pinch menus from cool restaurants like the Palm Beach Grill in Florida to help build e11even’s kitchen. A home gym is a nod to his love of fitness. He swims and uses elliptical machines. Travelling is a passion. He doesn’t smoke. Friday night is family night. And, sometimes people mix him up with another familiar MLSE face. “He’ll walk the (ACC) corridors and people will say ‘Richard Peddie’ and I get ‘Hi, Mr. Tanenbaum,’” says Richard Peddie, MLSE’s president and CEO, adding the men joke about it. Tanenbaum may be gaining a new unofficial title: No. 1 whipping boy for frustrated, Cupless Maple Leaf fans now that Peddie — a favourite lightning rod for Leaf Nation when it revolts over team failures — is retiring this month. And fans yearning for a Stanley Cup mirror the same desire within Tanenbaum, says NHL commissioner Gary Bettman, who has spent time with him in the MLSE chair’s row 7 ACC seats. And “when it comes to the Leafs, nobody is more passionate about the team and its role in the community and how it performs on the ice,” says Bettman. “I think there may be nothing more important to him to accomplish in the future than for the Leafs to once again win the Cup. Bettman says that drive is evident in the time Tanenbaum spends at the ACC. The NHL commissioner estimates Tanenbaum is at a Raptor or Leafs game 80 nights a season. That commitment has also overseen “damn close to $1 billion” invested in construction and redevelopment around Toronto, says Peddie. He rhymes off the MLSE checklist: $265 million for the ACC; $50 million in arena renovations, plus an annual $8 million in upkeep; $18 million in BMO Field (home of Toronto FC); $500 million in Maple Leaf Square, a property that includes e11even, Real Sports Grill, a sports apparel store, a boutique hotel and condos. Peddie says Tanenbaum was a key player in pushing MLSE to create and maintain high-quality facilities. In terms of athletics, hockey and basketball rule the MLSE flagship as its heavy-hitting franchises. So how did soccer fare when TFC first kicked off in 2006? Major League Soccer went through “a real transition” when TFC arrived, recalls MLS commissioner Don Garber. “It started with the enormous success we had in the market,” says Garber, referring to the capacity crowds at BMO Field. “It gave Major League Soccer an elevated status that I think very much came out of his view of the importance of the little things (to ensure) we had a very strong identity,” the commissioner explains. Tanenbaum has had dizzying achievement in sports. He’s also failed in spectacular fashion. “It’s recent success that’s blurred the past,” says Godfrey, now chairman of the Ontario Lottery and Gaming Corporation, who was at Tanenbaum’s side for their shared flop: not getting an NFL stadium built. Tanenbaum struck out on another Godfrey brainwave: building a domed sports stadium in downtown Toronto to house a major-league baseball team. “He put in a design bid to build the new stadium with the retractable roof — he didn’t win that contest,” notes Godfrey, the former Metro chairman who was responsible for bringing the Blue Jays to Toronto. Godfrey’s first brush with the Tanenbaums was with Larry’s father, Max, who donated about $100 to Godfrey’s first political campaign. Godfrey had never met the man so he visited him to say thanks. “Max said, ‘I’m giving you this and I’m never going to call you or ask for anything.’ You know what? He never, ever called me or asked for anything,” Godfrey recalls. “Larry is very much a chip off the old block,” Godfrey says of Tanenbaum’s charitable works. “It all goes back to the Tanenbaum family belief that if you take something out of the community like they have, you have to set the example for your children and your grandchildren; you have to give back,” says Godfrey. In 1911, Abraham Tanenbaum began community building in Toronto. A century later, his grandson maintains the family tradition.